McLennan County District Attorney Barry Johnson said his office is dropping all charges in the 2015 shootout between biker gangs in Waco. What followed was a prosecutorial fiasco as one by one, the criminal cases collapsed under a former district attorney’s leadership. During the four years of prosecution against dozens of alleged gang members, only a single case went to trial, resulting in a mistrial. The vast majority of the original 177 cases were dismissed. The Bandidos and the Cossacks both trace their roots in Texas to the 1960s, and for years, the Lone Star State biker gangs remained rivals. The trigger of the May 17, 2015, brawl, however, has largely remained mysterious, even as prosecutors interviewed dozens of bikers during the years-long investigation. Authorities said the shootout was the result of a turf war, arguing that the Bandidos were angry when the much smaller Cossacks club began wearing Texas patches on their jackets. Bikers who were present at the shooting have disputed this, with some saying that it began when one biker ran over another’s foot. Regardless, problems plagued the case from the beginning. Within hours of the shootout, former McLennan County District Attorney Abel Reyna issued 177 blanket arrest warrants for those found at the scene. No matter their suspected degree of involvement, all faced identical felony charges: engaging in organized criminal activity, resulting in murder and aggravated assault. 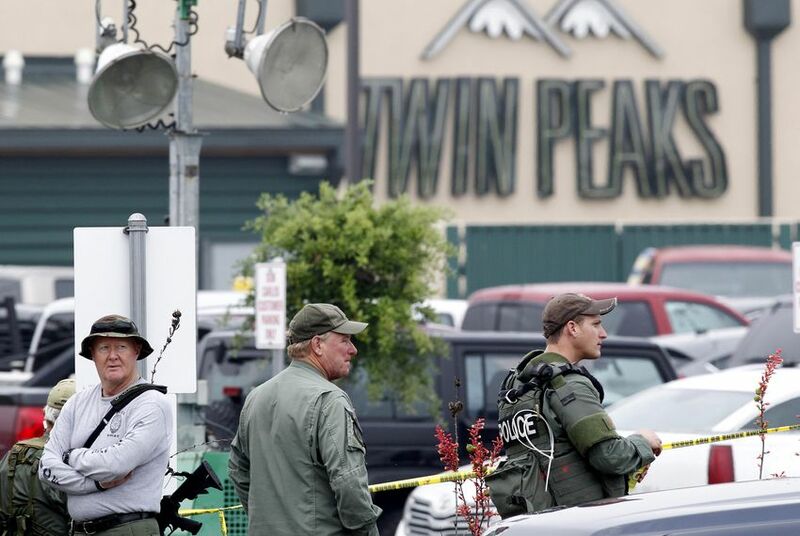 Some, however, were not even connected to the brawl and just happened to be wearing biker-like clothing while dining at Twin Peaks, where the Bandidos were hosting a social event. Multiple erroneous arrests resulted in multimillion-dollar lawsuits that are still pending, the Austin American-Statesman reported. At least 130 of the bikers have filed civil rights lawsuits against the police and DA’s office, angry they had been labeled “gang members” while insisting they were innocent of any gang conspiracy. Defense attorneys for the men weren’t the only ones who bashed Reyna for the blanket accusations. As former Harris County district attorney Johnny Holmes told the Houston Chronicle in 2018, “You got to prove who the bad egg is. You can’t just say, ‘I’m going to put all the chickens in jail.’ "
The only person to go to trial was Christopher “Jake” Carrizal, president of the Dallas Bandidos chapter. The county spent a total of $1.3 million preparing for Carrizal’s trial and investigating all the Twin Peaks cases, WAFB-TV reported. Speaking to the jury, the thick-bearded biker wiped tears through his black-framed glasses as he recounted being surrounded by Cossacks, “just lying there, waiting to be stabbed or shot,” as the Waco Tribune-Herald reported. Carrizal admitted he fired his gun but claimed it was in self-defense. In November 2017, the jury in Carrizal’s case voted 10-2 for acquittal, causing the mistrial. Johnson could have still upgraded those riot charges to felonies based on the violent acts in the parking lot. But the new district attorney said he did not believe this would be successful because the risky legal maneuver might not withstand an appeal. He said he feared wasting more taxpayer money and judicial and law enforcement resources.